Last week, Right-Brained Studio was in Oak Park, IL! 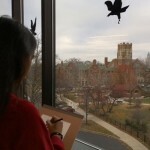 The Oak Park Public Library made for a great and inspiring setting to work on some sketching. Teen artist Caroline, age 16, used the architecture as her focus. To set up a customized youth art class, please contact us! We’re happy to “brainstorm” some options with you.